Could a B♭ by any other name sound as sweet? 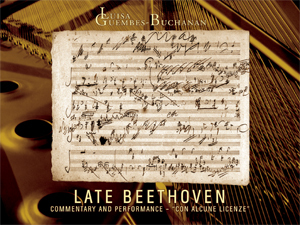 Peruvian-born pianist Luisa Guembes-Buchanan has recently released her first installment in what is a somewhat atypical essaying of Beethoven’s late keyboard works, as you will see below. The first thing one is likely to notice in this three-CD set is the unusual absence of the “Hammerklavier“ Sonata (No. 29), and the inclusion of the “Diabelli Variations,“ Beethoven’s last work for the piano, but not part of the canon of the 32 sonatas. Needless to say, my curiosity was piqued, and so there was no way to avoid asking what motivated this decision. It turns out that Ms. Guembes-Buchanan had quite a lot to say on the subject, much of which was new to me, and all of it quite fascinating. There are sure to be a few readers who will find some of the following material too heavy on technical detail, and perhaps not to their interest, and for that I apologize. I worried more over the content of this interview than usual for the very reason that Fanfare is not a professional publication aimed at academicians and musicologists. But I concluded that Ms. Guembes-Buchanan’s knowledge of and insight into these works illuminate her thinking and her playing in ways that are important and worthy of a hearing. L. G-B. 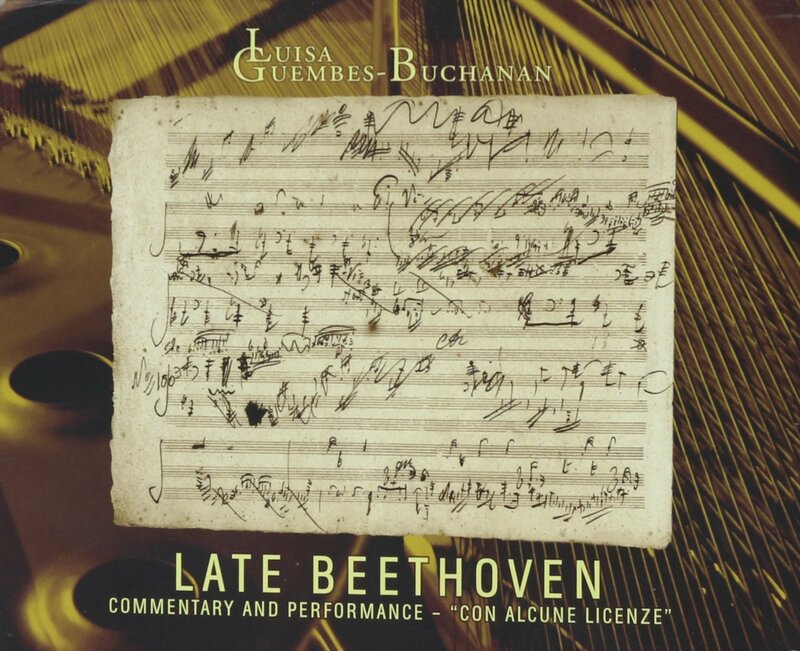 : The decision to record the “Diabelli“ Variations in this particular set was a personal one, based on what I perceive to be the relationship between the Variations and the other works of Beethoven’s late period style, particularly those written between 1819 and 1823. The most interesting of these is Beethoven’s self-parody of the Arietta from the last Piano Sonata, op. Ill, in the Finale and coda of op. 120. This relationship is a complex musical evolution in which the Arietta, itself influenced by Beethoven’s preoccupation with the “Diabelli“ in progress, becomes a compositional model for the last of the variations. When he finished the Variations one year after completing the sonata, Beethoven incorporated a variant of this idea into his coda, establishing a relation between them more intimate than exists between any other of his larger works. In the “Hammerklavier,“ on the other hand, and when perusing the sketchbook that contains parts of op. 101 and particularly the two cello sonatas op. 102,1 concluded that clearly the fugal movements of these works provided the seeds for the enormous fugue finale of the “Hammerklavier.“ Therefore, it is my intention to include the op. 102 cello sonatas with the op. 106 in my next set of recordings. J. D.: The connections you speak of within and between Beethoven’s works, especially in the late opus numbers, are pervasive and have been noted in the final group of string quartets, which are even later than the piano sonatas. Do you find similar interval cells and their permutations among the piano works? And if so, do you believe that Beethoven uses them, not just in a structural way to bind movements together, but also in some psychological way, like subliminal messaging, to telegraph meaning on a subconscious level? L. G-B. : Beethoven’s creative and compositional processes are a great source of theories and debate among musicologists, in part because we are lucky to have an incomparable amount of documents such as sketches and drafts of his works that permit us to actually see what went on at least in part in Beethoven’s mind, and more or less to follow how he shaped his musical ideas. Beethoven’s musical output is deeply rooted in the sonata form. His piano sonatas exemplify the musical integration of this form. From this background and within this language he formed his own personal style. This formal compositional set of principles was indeed the pillar upon which he added a huge variety of rich expressive textures, improvisational elements, fantasy, and memory. Beethoven’s drawing from his own earlier ideas is widespread. Leila Lucas has made a study of this. She calculates that 37 percent of his works contain motifs used elsewhere by him. Lucas has even categorized them into I believe three groups: “revision,“ “arrangement,“ and “adaptation.“ William Kindermann investigated the compelling force of the dramatic continuity in Beethoven’s creative processes and his strategies for reconciling the parts as a whole in works from different stages of the composer’s life. An example he cites is that of the op. 7 Sonata in B♭ evolving from its third movement, which was conceived first as one of a set of four bagatelles. J. D.: Not to change the subject too abruptly, but I recently reviewed a recording—two recordings in one, really—of the “Diabelli“ Variations with Edmund Battersby on Naxos playing the piece twice, once on a modern copy of an 1825 Conrad Graf fortepiano, and again on a 1976 Steinway model D concert grand. The contrast was really quite dramatic, affecting not just the surface sound of the music, but the consistency and integrity of the piece on a structural level. You have obviously opted for a modern instrument in your recordings; and for most of us who came to know these works before the period-instruments movement became the major force it is today, Beethoven on a big, resonant, powerful piano was not only the norm, it was what we were quite sure the deaf composer heard in his mind’s inner ear and would have wanted. By the time Beethoven came to write his final essays for the piano (between 1820 and 1823), it was not the same instrument he would have known from 20 years earlier. Significant technical advances in design and in the workings of the various mechanical components had taken place. Though deaf, Beethoven was well aware of the improvements, and wrote to take advantage of them. The real question, it seems to me, is this: was he writing for the most advanced instruments available at the time, or, in the isolation from reality imposed by his deafness, did he invent an as yet unheard and unimagined Goliath? L. G-B. : Beethoven was born during a time when keyboard instruments were undergoing great changes. During his early years, he became familiar with the clavichord, harpsichord, organ, and fortepiano. Exactly what instrument he played in his early years is confusing due in part to the fact that the name “klavier“ was used to designate any keyboard instrument. Neefe, Beethoven’s teacher, founded a keyboard-manufacturing firm that employed a number of the period’s master makers. We can assume then that Beethoven was familiar with the latest innovations from early on. For example, two of his early Bonn compositions (1784) are forclavecin ou fortepiano. The range of the fortepianos, which started at 63 notes, expanded, and during Beethoven’s lifetime reached down to the lower C—down three octaves from middle C—to F, four octaves and a fourth above. Beethoven made good use of these expansions, particularly for dramatic effect during his middle period. His favorite instrument at this time was a Streicher, noted for its dynamic range. Beethoven took great interest in the development of the instrument, and owned a variety of them. His evaluation of each of them attests to the great importance he placed in the sound that each instrument produced. In 1803, he was given an Érard that soon dissatisfied him. Between 1814 and 1817, he acquired at least three pianos by various makers. In 1817, Broadwood produced a piano that not only had equalization of the string tension but an extended range of six octaves. Beethoven received a Broadwood as a gift in 1818. This piano was prominently displayed in his last residence, and has been lovingly restored and is on display in Budapest. In 1825, Beethoven purchased or was possibly given a Graf, made to his specification and with a range of six-and-a-half-octaves. Though Beethoven, like Bach in some ways, transcends the instrument, I do believe that—however provocative or challenging some of his dynamics or markings may be—they were meant to be practical and realizable. J. D. : Beyond questions of sonority posed by the instrument itself, there are things of such technical curiosity, even bizarreness, going on in the notes of the music. If Beethoven transcended the physical sound of the piano, it seems that simultaneously he took leave of some of the most fundamental tenets of musical practice—for example, the arithmetic requirement that the note values within a bar add up to the number of beats specified by the metric signature. This was noted as far back as 1855 by W. de Lenz, in his Beethoven and his Three Styles. He cited the matter of the second variation in the Arietta movement from the C-Minor Sonata (No. 32), op. 111, in which six 16th notes plus six thirty-second notes in each measure do not square with the meter of 6/16. Another instance of this new math occurs in the first Adagio ma non troppo, marked Recitativo, in the AHVIajor Sonata, op. 110. The meter is 4/4, yet the fifth bar contains the equivalent of 29 thirty-second notes, three thirty-second notes short of a full measure. The sixth bar contains the equivalent of 38 thirty-second notes, or six thirty-second notes too many. Was Beethoven not playing with a full deck, or has his thinking advanced so far that it anticipates the elimination of bar-lines and the metric system altogether? L. G-B. : The Arietta movement of op. Ill is a marvelous type of variation based structurally on the last variation movement of op. 109. It contains gradual rhythmic diminutions and a gradual climbing into the higher registers of sound. The indescribable quality of the second half of the Arietta comes from the transformation of the theme and the synthesis at the recapitulation. I think what Beethoven intended is clear when we read the tempo indication, L ‘istesso tempo. That indicates to me that Beethoven wanted to maintain the tempo while increasing the sense of mounting motion, thus, the change to 6/16, which incidentally does add up if you think of the groupings as triplets. I believe that the subsequent variations bear this out. I find it an exquisite and extremely clever way to convey such elasticity and at times a feeling of moving while at the same time remaining still. In the Sonata, op.l 10, Has Adagio ma non troppo is operatic and declamatory in nature, and after studying the sketch of the measures in question, you see the second B-Minor chord in the left hand is placed somewhere after the middle of the 32nd group of As, and not all the notes are lined up. The improvisatory and aria-like compositional gesture and intent of this section makes me believe that there are exactly as many notes as needed. J. D. : You’ve touched on an extremely crucial element in Beethoven’s music, and that is motion or momentum. No other composer I know of managed to convey a sense of utter stillness—the absence of motion, really—that Beethoven often achieves; and yet, it is a stillness of such rapt ecstasy that the heavens themselves seem to open before us. This cessation of motion, if you like, is more a function of harmony than it is of rhythm. You allude to this yourself in quoting Wendell Kretschmar, fictional music teacher, speaking of the Ctt that appears for two measures, six measures before the end of the op. Ill: “Something entirely unexpected and touching in its mildness and goodness, this added Ctt is the most moving, consolatory, pathetically reconciling thing in the world. It is like having one’s hair or cheek stroked, lovingly, understandingly, like a deep and silent farewell look. It blesses the object. . . with overpowering humanity . . . and lies in parting so gently on the hearer’s heart in eternal farewell that the eyes run over.“ Certainly, in the area of harmony, Beethoven seems to have been no less unconventional than elsewhere. A passage midway through the slow movement of the “Hammerklavier“ is as breathtakingly beautiful as it is breathtakingly eccentric. Beethoven cancels out the key signature, changing it to all naturals. Then, for the next two bars or so, he sharps every single note. How to explain this? The key of the Sonata is B♭ Major. A pianist friend of mine once suggested that this passage might be interpreted as a view of the Minor side of B♭ as seen through the key of At Minor, which is really the enharmonic equivalent of B♭ Minor. The passage sounds perfectly normal, and transcendently beautiful when heard, but on paper, it looks so weird. You just have to scratch your head, and wonder, “What was Beethoven thinking?“ Was he just being contrary? Or does the At serve as a structurally balancing fulcrum between key areas and/or movements that is not immediately apparent. I suspect the latter, since I don’t think a composer of Beethoven’s stature ever does anything without reason, even if to the casual observer it may seem arcane. What is your take on it? L. G-B. : The two fundamental questions that one can ask about Beethoven’s creative process are why he composed and how he composed, both in general and in reference to a particular work. But when one asks detailed questions about why a work ends in, say, C Major, or why particular notes occur where they do, the answer I feel lies in Beethoven’s aesthetic sense. Charles Rosen has shown the organic unity of op. 106. It is based on the observation that all four movements are constructed around a central idea, a never-ending chain of descending thirds. In his book, The Classical Style, Rosen observed that op. 106 “is an extreme point of his style. He never again wrote so obsessively concentrated a work.“ The Adagio movement you refer to is in F♯ Minor, enharmonically a third down (Gt) from the B♭ Major of the first two movements. The opening has ascending thirds that serve as a transition from the Scherzo and a series of descending thirds as in the previous movements. The two themes: the first played una corda throughout, is brightened slightly by the Neapolitan G Major in the upper registers. The second theme, played tutte le corde, is a more passionate and intricate elaboration of the melody. When the music changes key to D Major, again a third lower, after 40 bars, a new more hopeful region opens up, leading eventually to what Kindermann calls “a vast contemplative stillness.“ The development is a series of harmonic sequences based on descending thirds that end or rather converge at the recapitulation. Here is one of those profound moments where Beethoven reinterprets the opening theme with moving thirty-second figurations against pedal points in the bass. In the coda, the theme returns in G Major where Beethoven, through a progression of rising thirds, brings the work a third higher, to B Minor. A series of dramatic F♯s played una corda add a sense of resignation. Finally, the theme is resolved in F♯ Major with Att (enharmonically B♭ doubled in the inner voices in the last measures. The masterly use of the pedals and of enharmonic progressions leads me to believe that control over the quality of sonority, its use as a structural device as well as an expressive tool, constitutes one of the most remarkable feats of Beethoven. J. D. : So, to my title question, “Would a B♭ by any other name sound as sweet?“ the answer must be, “Yes, in Beethoven’s ‘Hammerklavier,’ when it’s an At.“ These works have long been recognized as so central to our musical heritage and so important to Western culture that virtually every pianist of note has wished to leave as part of his or her legacy recordings of at least some, if not all, of them. I, for one, do not view this as joining a crusade that has already been fought and won by others who have gone before you. There are great performances of this music by the likes of Schnabel, Annie Fischer, Emil Gilels, Claudio Arrau, Alfred Brendel, Richard Goode, and others too numerous to mention, but none is definitive. The music is too technically complex and too spiritually exalted to reveal all of its secrets at once and to one artist. That is why new readings will continue to provide new revelations. Besides the “Hammerklavier,“ what will your next installment contain, and when might we expect the project to be finished? Are there plans in the works beyond the Beethoven that you can tell us about? L. G-B. : I can speak of my most recently finished project that has given me great joy, and that is a two-CD set containing the five sonatas of E. T. A. Hoffmann and Schumann’s Kreisleriana. Hoffmann’s writings, and in particular the fictional character Johannes Kreisler, were a pivotal force in Schumann’s compositional life. Wagner, Brahms, and Mahler were also touched by Kreisler. Hoffmann’s musical essays—for example, his essay on Beethoven’s Fifth Symphony—led me to study Hoffmann and learn about his musical works. I found an enormous amount of highly interesting material. Both Hoffmann and Schumann share not just their literary and musical worlds, but also the restlessness and extreme emotional polarities that embody, in my opinion, 19th-century Romanticism. As it happens, Beethoven knew of Hoffmann and in 1820 composed a two-part canon for him. It is a joke dealing with Hoffmann’s name. I could not resist including it in the set. Your first question led me into Beethoven’s compositional strategies and connections that of course permeate his works. Inevitably, op. 7, which evolved from its third movement now is at the forefront of my studies. Op. 10/3, with its D-Major short motive that is worked over in all of its four movements will eventually lead me to the recording of all of them. This article originally appeared in Issue 29:4 (Mar/Apr 2006) of Fanfare Magazine.